Can an ‘Eyesore’ Be Significant? Some local modern buildings from the mid-century period were trashed in the Washington Post today. The piece, “An Eyeful of Washington Eyesores,” was based on submissions by readers who nominated what they thought are the “ugliest buildings or landmarks in the D.C. area.” Marcel Breuer’s HUD building in Southwest, Georgetown’s Lauinger Library by John Carl Warnecke and that funky blue 1963 building in Ballston just off 66, known officially as the Blue Goose, which is owned by Marymount University, made the list. 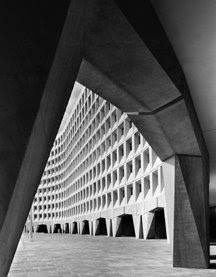 These designations and the buildings’ nominations to be included in the National Register of Historic Places, is part of a major effort by the General Services Administration (GSA) Preservation Services Division to catalogue and preserve Modern-era federal buildings. During a recent D.C. Preservation League forum on evaluating the significance of modern structures, Kristi Tunstall, a preservation specialist with GSA, said that more federal buildings were built between 1950 and 1979 (34 percent) than any other time period. Wow (as my one-year old son likes to say), a government committee that actually did something cool. Imagine that. I have to say, I take great exception to Lauinger Library being included in the list. I went to Georgetown and while I acknowledge that in some ways, the building doesn’t actually function particularly well as a library, as a work of architecture, it’s remarkable. I think the reinterpretation idea was brilliant. Georgetown is a really old school that has evolved tremendously over the centuries. It’s only fitting that the architecture should evolve with it. However, it is still a place that values tradition. I smile every time I come across Key Bridge and see Lauinger with Healy in the background. From just the right angle, it also nicely echos the National Cathedral. My fondest memory of the scene is when they were building the Southwest Quad and there were construction cranes in the parking lot that mimicked both Healy and Lauinger: past, present and future. I hope the university never does anything as silly as tearing it down.